A number of critics and legal experts have questioned President Rodrigo Duterte’s order to place the Bureau of Customs under temporary military control. Duterte on Monday ordered a temporary military takeover of the BOC, with its police placed on “floating status.” He required the bureau’s members to report to him to directly. The move came in the wake of former customs chief Isidro Lapeña’s transfer to the Technical Education and Skills Development Authority, following the recent P11-billion shabu shipment controversy that hit the BOC earlier in October 2018. Prior to the order, Duterte named former AFP chief of staff and Maritime Industry Authority administrator Rey Leonardo Guerrero as Lapeña’s replacement. Both Duterte’s move to choose Guerrero and the military takeover of Customs has been questioned by a number of legal experts and administration critics. Human rights and environmental lawyer Antonio La Viña in an interview with DZMM said that the military takeover was unconstitutional. “First, civilian authority should always be superior to military authority. Second, no soldier or official currently in service should be appointed or designated in any capacity to any civilian post. Third, you can’t just remove civilian officials without due process or a law,” La Viña explained. Former solicitor general Florin Hilbay, meanwhile, said that the order was both against the 1987 Constitution the rules on civil service. Sen. Chiz Escudero, another lawyer, in a series of tweets also questioned the basis for Duterte’s order. Under Sec. 18, Art. VI of the Constitution, the President, as Commander-in-Chief, can only call out the Armed Forced of the Philippines to “prevent or suppress lawless violence, invasion or rebellion.” These factors are not attendant at the Bureau of Customs. He said that it was possible that Duterte only meant for the AFP to assist in the law enforcement function of the BOC, which was a valid exercise of their power. Perhaps what PRRD meant was for the AFP to assist in the law enforcement function of the Bueau of Customs which, to a certain degree can be done as with other law enforcement activities where the AFP has been called upon to assist the PNP. Some online users also joined in criticizing Duterte’s order. A number of constitutional provisions have been invoked by those questioning Duterte’s order, particularly those on the supremacy of civilian authority over military authority and the ban of active military personnel being appointed to civilian positions in the government. Lawyers in the administration have defended the constitutionality of Duterte’s order. 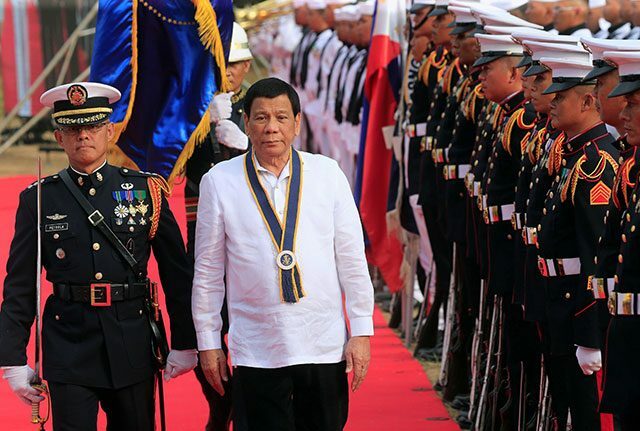 Presidential spokesperson and chief legal counsel Salvador Panelo also said that Duterte was exercising his “constitutionally mandated functions” as both chief executive and commander- chief of the armed forces. The first part of Article VII, Section 18 of the Constitution allows the president as commander-in-chief “whenever it becomes necessary” to call out the armed forces to prevent or suppress lawless violence, invasion or rebellion. Duterte has defended his appointment of a number of former military personnel to his Cabinet following accusations of his cabinet undergoing “militarization,” saying that military men worked faster and were not corrupt. “That is why I like the military. Just tell them to do it. There is no corruption there,” he said at a speech in Bacolod last Saturday. “They say there is militarization in the Cabinet. Remember this: I have nothing against the bureaucracy. But you know that in the bureaucracy, things are really awfully slow,” he added. Among those fomer military men he has appointed to important cabinet positions are former AFP chief Lt. Gen. Glorioso Miranda (Bases Conversion and Development Authority), former Lt. Gen. Eduardo Año (Department of Interior and Local Government) and former Gen. Roy Cimatu (Department of Environment and Natural Resources).